I’m a driver and a cyclist in Pennsylvania. I was recently reviewing the Pennsylvania Driver’s Manual, PUB 95 (1-15), and noticed a diagram on page 42 that promotes unlawful driving. You should fix this diagram ASAP! The diagram shows what appears to be a four-foot-wide box CENTERED on the cyclist, and a car passing the cyclist with about 1 FOOT OF CLEARANCE between the cyclist and the car! 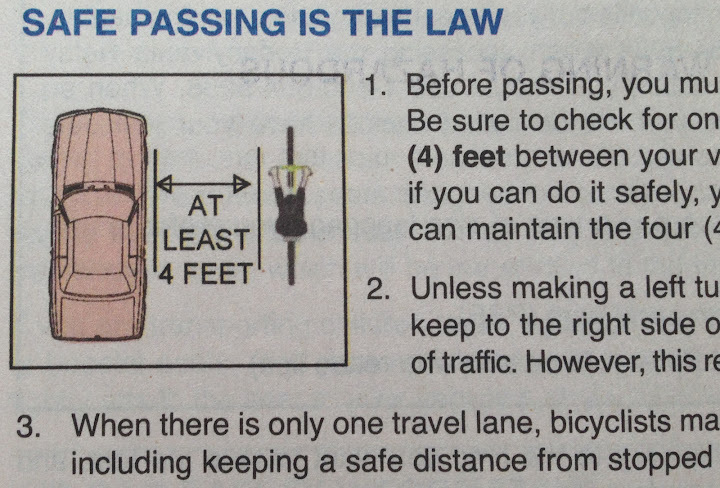 This is against the law, as nicely diagrammed on page 90 of the book, which correctly explains that Pennsylvania law says that a car passing a cyclist must give AT LEAST 4 FEET OF CLEARANCE, not 1 foot! Your driver manual, in its current form, encourages unlawful driving, with that bad diagram on page 42. Hundreds of people a day (both 16 year-olds getting learner’s permits and seniors taking refresher courses) are being taught using this unlawful, dangerous diagram. I really wish they would use, as analogy, the example of a tree branch in the road. Just as you would wait for oncoming traffic to clear before crossing the center line to get around a downed tree limb, you wait until traffic is clear to get around a much slower cyclist. I would especially love it if they would explicitly state 3301a6, that it is legal to cross a yellow line to pass a cyclist if you can see it is otherwise safe to do so. Stu: they explain on page 90 that you can cross the line (text excerpted below) but in that horrible diagram on page 42, they botched the 4 foot concept royally. The caption on 42 is reasonable “leaving at least 4 feet of space for safety” but that diagram is awful. 1. Before passing, you must first decide whether you can maneuver around the bicyclist. Be sure to check for oncoming traffic. When passing, you must allow at least four (4) feet between your vehicle and a bicycle in order to pass safely. If necessary and if you can do it safely, you are permitted to cross the center double yellow line so you can maintain the four (4) feet of clearance between your vehicle and the bicycle. 4. Drivers cannot turn into the path of a bicyclist who is riding straight ahead on a roadway or shoulder. 5. You cannot force a bicyclist off the road. If you do this, you may face criminal charges.